MSP’s have highlighted today how local government pension funds could make a useful contribution to infrastructure in Scotland. The Scottish Parliament’s Local Government and Regeneration Committee has published a report on pension fund investment in infrastructure and City Deal spend. This is a good analysis of the current position and they examine the barriers to infrastructure and other socially useful investment. The Committee draws attention to the UNISON Scotland report Funding and building the homes Scotland needs 2013. I wrote this paper with assistance from the Scottish Federation of Housing Associations. It called for local authority pension funds, with Government backing, to invest in Registered Social Landlords providing low risk and socially useful investment. Sadly, nearly three years later, there has been only a limited take up of this proposal, while £billions have been invested in overseas equities – not to mention arms companies, tobacco firms and fossil fuels. The Committee identifies a number of barriers to infrastructure investment. Most of these have been recognised by the Scheme Advisory Board (SAB) for the Scottish LGPS and are included in their current workplan. The investment regulations limit the amount of investment each fund is allowed to invest in infrastructure and other categories. These are overly prescriptive and the SAB at its last meeting recommended abolishing them and replacing the regulations with a more flexible code of practice. “37. Our attention was also drawn to WYPF and its approach to in-house investment management. In its written submission, it gave a number of advantages over externally managed funds, namely the speed of identifying potential infrastructure opportunities, the speed of authorisation for new infrastructure investments and the ability to manage investments over the longer term as in-house investment managers were free to make investment decisions based on a long-term assessment of the investment and returns. The report briefly touches on the pooling of funds as one way over reducing costs and building expertise. This follows the UK Government’s decision to push funds in England and Wales into six ‘wealth funds’. Guidance on this was published last week as part of the Chancellor’s Autumn Statement. The Committee was ‘less attracted’ to this formal approach, drawing attention to the informal links that exist between funds in Scotland. The SAB has this issue in its workplan and is starting with new data collection tools that should inform this exercise. Pooling investment is not just an issue for infrastructure investment. It is also a means of improving transparency and reducing the very high costs of external investment. The Committee is right to question such investments as UNISON representatives have been doing at pension boards. While pension funds are part of local government they are also bound by public law duties that government has placed on councils, such as climate change. Overall, this short inquiry is a useful overview of pension funds and infrastructure investment and well worth a read. Most of the issues they have identified are being taken forward by the SAB, but there is also an issue of pension fund culture to be addressed. That may be a more intractable challenge. There needs to be a root and branch look at Police Scotland’sbudget next year. We can no longer paper over the cracks caused by badlymanaged centralisation. Police Scotland’s finances got off to a poor start when thehastily drafted outline business case was never followed through to a fullbusiness case as Audit Scotland confirmed. As a consequence there remain unrealistic expectations of whatcan be achieved. This is illustrated by a £25m (and rising) budgetaryblack-hole in the 2015/16 budget. IT systems that are crucial to reform have sufferedfrom delays and overspend. Getting systems right is not just about cost andefficiency, as the M9 tragedy showed. The HMICS report has taken into accountthe high level of pressure that UNISON police staff members work under in theContact, Command and Control (C3) division of Police Scotland. Let’s hope thisreport shapes the C3 direction with greater accountability and assurancesfor the public. The findings of the Police Scotland staff survey are a starkreminder of the impact reform has had on the workforce. A committed anddedicated workforce has become increasingly demoralised and overworked with theperception that the organisation they work for doesn’t care and won’t invest intheir health, safety and wellbeing. Only8% of staff thought the organisation was genuinely interested in staff wellbeing. Police reform was meant to identify efficiencies throughreductions in duplication of posts. However, proposals are purely designed to reducebudgets, not reduce duplication. Through the pursuit of an agenda ofcentralisation, we have seen the closure of mainly local service provisionssuch as; station front counters, call-handling, control rooms and custody. Thishas resulted in police staff who come from and are stakeholders in the communitiesthey serve, being sacrificed to maintain police officer numbers at anartificially high number. There has still been no indication that detailed work hasbeen carried out to establish the number of officers required to policeScotland. The previous Chair of the SPA announced that this work was to goahead shortly after his appointment, but we are still waiting. Nor has any workbeen carried out to establish how effective this figure is in maintaining lowcrime figures. Police Scotland has a statutory duty to abide by Best Valueprinciples and a proper study is long overdue. Significant numbers of police officers are now performingroles which can and should be performed by police staff at a fraction of thecost. Recent figures show that there may be a gap of approximately 7,000 policeofficers who are not frontline when compared to the 17,261 officer strengthfigure quoted by the SPA. The decision to employ 1000 extra Police Officers was takenpre-austerity and there is now widespread support to review this figure. Forexample, the Police Superintendents (ASPS) has said: “There is clearly some significant budget pressure andchallenges ahead. We would like to see an intelligent conversation to considerall of the options. Included within that would absolutely be whether thelock-in on 1,000 additional officers remains the right policy, or whether it’stime to review that and look at more of a mixed staffing model. It is now time to look closely at the total workforce requirement of Police Scotland to ensurea balanced workforce; the correct types of Staff or Officers carrying out rolesappropriate to their qualifications and needs of the organisation. I would also agree with colleagues in the Scottish PoliceFederation that the Scottish Governmentwould be foolish to continue with its programme of police cuts in the wake ofthe Paris terror attacks. This is only one of many additional burdens being placed on Police Scotland. The unique and major flaw inpolice reform has been the cosmetic police officer number target that shouldhave corrected when Police Scotland was created. This flaw does not allowmanagement to make the right Best Value decisions to create an effective,efficient, modern police force for Scotland. It’s time to change course or itwill only get worse. Eliminating fuel poverty by Nov 2016? I think not. Given the short term thinking that bedevils much political thinking, we can be forgiven for looking cynically at government targets that stretch long ahead of the political cycle. However, sometimes they catch up with governments. One such legislative target is the eradication of fuel poverty in Scotland by November 2016. This target is given some focus for me today, as I am chairing a session at the annual conference of the fuel poverty charity Energy Action Scotland. UNISON Scotland is affiliated to this campaigning charity that also delivers a wide range of practical actions to help alleviate fuel poverty. Fuel poverty is defined as a household having to spend 10% or more of its income on energy to maintain a warm home. When I first got involved it was almost exclusively an issue for the elderly - no longer. A recent report by Citizen's Advice Scotland told the story of a father of a two-week old baby who was left without any money for gas and electricity, after being told he had to wait two weeks for a Universal Credit payment. Another case in the east of Scotland involved a couple with a nine-month-old baby girl being left without any money for food or gas and electricity. Their benefit was stopped by the Department of Work and Pensions after it claimed a sick note had not been received - even though it had been sent the previous week. According to CAS, the number of Scots in 'fuel poverty' has soared by 130% in the past five years, with shocking cases of struggling households being left for months without any means of heating or cooking. They dealt with 28,000 cases involving energy issues in 2014-15 – an increase of a third from the previous year and up 130% since 2011. Energy Action Scotland's Director Norrie Kerr, has also said that they see a lot of younger people in fuel poverty who are on the minimum wage or less than the minimum wage, who are really struggling just to make ends meet: “It is not just about pensioners any more, it is about in-work poverty. When you are being squeezed like that there is the very real dilemma for people between heating and eating. In some cases foodbanks are being asked for food parcels that don’t require people to heat anything, because they are frightened to put on the cooker to boil a pan of pasta or heat a tin of beans." So, are we going to meet the legislative requirement to eliminate fuel poverty by November 2016? Based on what we heard at today's conference, almost certainly not. Are we making sufficient effort to try and reach this target? Again probably not. One particular disappointment is the Scottish Government's decision to postpone a consultation on energy efficiency measures in private sector housing. This is the fastest growing housing sector and landlords need help and support, and tenants need protection against unjustified rent increases. CAS covered this issue well in their report 'Coming in from the Cold'. Funds have been made available for fuel poverty, but it simply isn't enough. We heard about a some measures and more task groups and reviews. As with other policy areas we are very good in Scotland at analysing the problem - less good at making difficult decisions to solve them. Equally the UK government programmes are also inadequate, but as some are to be devolved, we have an opportunity to bring programmes together and do some things differently. Energy efficiency is only one aspect of the measures needed to tackle fuel poverty. The other two are the price of energy and income support. Action on prices have been limited with the cost going up by 180% between 2002 and 2013. If prices had gone up with inflation fuel poverty in Scotland would be below 11% of households, instead of 39%. It has only been helped very recently by the drop in wholesale prices - rather than government action over the failed energy market. Government's put great emphasis on switching supplier and there has been some increased take up recently. However, it is far from a smooth process. I recently switched supplier and was presented with an absurd estimated opening gas reading that was almost double my last bill. As a consequence I was presented with a bill for £3,600! On income support, the U.K. Government's slashing of social security is having a devastating impact on low income families in and out of work. We should also not forget the cut in real wages over a decade or more. This is something the Scottish Government could do more on, including the living wage for care workers. As Jackie Baillie reminded us today, the £1300 cut in Tax Credits is the equivalent of the average annual fuel bill. If the same number of people suffering from fuel poverty had an illness or disease we would be crying out for the government to take action by pouring resources into the NHS. It's time to treat fuel poverty with the priority it deserves. The monsoon rain that hit Scotland in recent days should be a stark reminder that we need to take responsibility for climate change. As today's Scotsman editorial elegantly puts it; "It’s time we stopped pillaging the earth’s finite resources to create short-term gain for the few at the expense of the many." The Met Office gave us a clear warning yesterday with global temperatures set to rise more than one degree above pre-industrial levels. This means the world is half way towards 2C, the gateway to dangerous warming. It is to be hoped that this new data will add urgency to political negotiations in Paris later this month aimed at securing a new global climate treaty. But I wouldn't hold your breath! In Scotland, we have ambitious, world leading climate change legislation, but have yet to meet any of the interim targets. As my old gran used to say "promises butter no parsnips". The climate change equivalent might be; "Ambition won't save the planet". The Stop Climate Chaos Scotland coalition has recently published a manifesto for next year's Scottish Parliament elections. We have been taking its proposals around the party conferences in recent weeks, with well attended fringe meetings and lots of interest from delegates. At each event party spokespersons have been broadly supportive, but more cautious when it comes to detailed action. All the party leaders have signed a commitment that their manifesto's will be consistent with the ambitions of Scotland’s Climate Change Act. I was speaking at one of these events on one of the more challenging policy areas, transport. Transport accounts for a quarter of Scotland’s greenhouse gas emissions, but is the area of least progress, both in policy and in emission reductions. We need to make a significant shift to public transport by disincentivising the car where alternatives exist. That's because cars are the largest source emissions, 40% of the total, and road traffic miles are forecast to increase by 25% between 2002 and 2020. An active travel policy with greater emphasis on walking and cycling also has obvious health benefits. Not to mention the 2000 deaths per year from air pollution. Then we have air travel. Air Passenger Duty is soon to be devolved and almost all the debate has focused on reducing it. Air travel is the highest emitter per passenger kilometre - domestic flights in particular. A 50% cut in APD would put an additional 60,000 tons of CO2 into the atmosphere. Again, it's also a social justice issue because half the public don’t fly. They rely on other forms of transport that don't operate on a level playing field with air travel. Air travel is exempt from VAT and aviation fuel is tax free. Lower carbon train fares and bus fares are going up rapidly. Credit to Kez Dugdale for highlighting the cost of cutting APD in her conference speech. Supporting low paid workers through tax credits, is a better use of the tax revenue than promoting more polluting flights. The Met Office data means action on climate change is more urgent than ever. There will be no where else for our children to go once we have fried the planet to oblivion. We should make some big strides in Scotland next year by facing up to difficult policy change like transport. Not just for the environment, but for social justice as well. P.S. 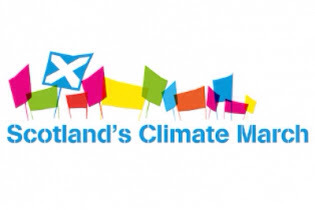 Support Scotland's climate change march in Edinburgh on 28 November. We took the Trade Union Bill campaign to the Scottish Parliament today. Scottish Labour used their time to ensure that MSPs had an opportunity to debate this legislation. UNISON General Secretary Dave Prentis told MPs scrutinising the legislation at Westminster that these draconian proposals are ‘a major attack on workers’ rights in this country’ and ‘a negation of democracy’. Today was an opportunity for Scotland's politicians to show that there is no mandate for this legislation in Scotland and they didn't disappoint. Almost all MSPs attacked the Bill in the clearest possible terms. Today's debate should have been on a Legislative Consent Motion (LCM). Unsurprisingly, the UK Government's delegated powers memorandum says the Bill is reserved and therefore no Legislative Consent Motion is required. However, the provisions on facility time and DOCAS are clearly about public administration which is devolved. This is reinforced by the policy justification which focuses on public spending and the fact that these provisions only apply to the public sector. As the UK minister has confirmed, Ministers running English departments will be able to direct public bodies in Scotland on facility time. This is without doubt the most serious breach of the devolution settlement since 1999. Kez Dugdale led on the LCM point from the outset and the Welsh Government made similar arguments. There was welcome support for this position in today's debate from Scottish Ministers. Roseanna Cunningham outlined four grounds on which a LCM could be based. At Westminster yesterday during the Scotland Bill debate, Shadow Scotland Secretary, Ian Murray asked if, in the current context, the Government “would require a legislative consent motion for the Trade Union Bill?” David Mundell responded by stating that the nature of any legislative consent motion required is determined as the Trade Union Bill is finalised. That's an interesting answer, even if not consistent with the Memorandum of Understanding, depending on how you define 'finalised'. 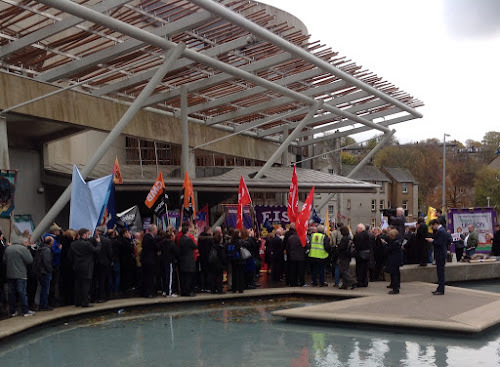 Today's debate reflected the context of Scottish industrial relations. As the recent 'Working Together' review showed, there is a distinctly different industrial relations culture in Scotland and this is being taken forward in the Fair Work Convention. This is particularly the case in the public sector - the target of this UK legislation. That's why Scottish public opinion is against the Bill, reflecting UK wide public opinion that this is a solution to a problem that doesn't exist. Tory MSPs Murdo Fraser and Gavin Brown looked lonely figures on the Tory benches during today's debate - 'agency staff' as Neil Findlay quipped. In fairness, their contributions reflected Ruth Davidson's constructive blog post about trade unions on Conservative Home, which interestingly made no mention of the Trade Union Bill. Sometimes it's more interesting to note what politicians don't say! Murdo Fraser has himself written constructively on trade union issues. The problem for the Scottish Conservatives is that the UK minister driving this bill uses very different language. Today's debate was an important opportunity for MSP's to take a stand against the Trade Union Bill and we are pleased with the cross party support for the campaign. It's now important that we build on this support by forcing the UK government into legislative consent and then build resistance to this pernicious legislation. Today, the Scottish Labour conference in Perth will debate the replacement of Trident. Having a debate is in itself a huge achievement. It is due to an imaginative members day initiative by the leadership of Scottish Labour and the support of both trade union and CLP sections in the priorities ballot. The UNISON Labour Link Scotland delegation will be voting for the motion that opposes the replacement of Trident. Here's why. Secondly, I understand the concerns of trade unions with members in the industry over the impact on jobs. The trade unions in Scotland have addressed this in the STUC report 'Trident and Jobs'. This detailed analysis makes the case for a Scottish Defence Diversification Agency and draws on experience from around world, that shows this can actually be done. A proper analysis of the relatively small number of jobs associated with Trident, compared to the cost, shows that skills can be transferred to other defence options that are currently closed down because of Trident's burden on the defence budget. The motion debated today offers strong protection for defence workers. Thirdly, the escalating cost of Trident, now up to £167bn, means that replacement is simply unaffordable. At a time of austerity these resources could also be better used to secure vital public services. This sum is the equivalent of the total devolved Scottish Budget for five years! Scotland's share would make a significant dent in the financial gap caused by Tory austerity. There are those who object to nuclear weapons in principle. They make the moral argument that ownership of weapons of mass destruction can never be justified. They also argue that Britain has no right to own such weapons under international law. Important though these arguments are, the campaign against Trident has been boosted by pragmatic opponents who emphasis that Trident is 'militarily useless' and cost escalation makes it unaffordable. I have heard it argued that it is easy for UNISON to take this position because we don't represent workers who could be employed on the Trident programme. I would respond to that by pointing out that we do have other policy positions that impact on our members jobs. Where we do, such as scrapping the crazy energy market, we develop clear policies to protect the members concerned. That is precisely what the unions who are involved in the defence industry have done over Trident. There are times, when to retain credibility, trade unions have to accept that they can't defend the indefensible, just because it has an impact on our members. Trident replacement is just such a policy. Spending £167bn on a useless defence system is indefensible and that's why we will vote for the motion to scrap it today.